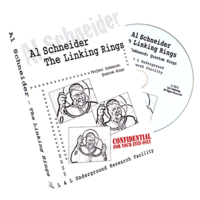 Today, when you order "Al Schneider Linking Rings by L&L Publishing - DVD", you'll instantly be emailed a Penguin Magic gift certificate. You can spend it on anything you like at Penguin, just like cash. Just complete your order as normal, and within seconds you'll get an email with your gift certificate. 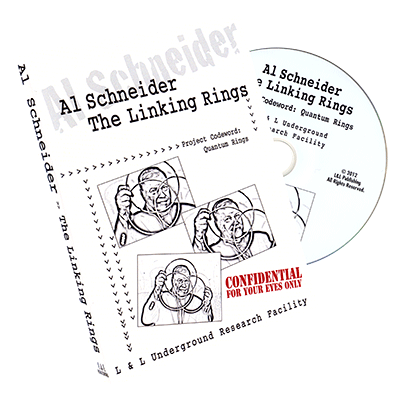 More great thinking by Al Schneider!!! I already have his 5-ring routine on another DVD or two, but wanted to see his larger stage routine and get his input on the rings as he always has a different take than anyone else. Al does a lot of seated magic, but he's an excellent stand up performer as well. He always has phenomenal handlings of the classics! Many magicians tout the Dai Vernon routine with the rings, but I prefer Al's approach. I've seen the Professor perform his ring routine in his later years, and I don't know if it was better in his younger days, but it appeared to me as a mish-mash of perplexing moves with lots of noise--tough to follow. Al has a convincingly deceptive ring count that is superb!!! If you do the rings, get this. Lots to praise here!!! Nice, simple and easy and just using several rings. Highly recommend.